We first wrote about a service called 1000memories back in July 2010. The site was setting out to address a topic that people don’t like to talk about, but is universal all the same: when people pass away, their friends and family members like to remember them and celebrate their memories. That can be difficult though — these people are often separated by great distances, and it’s hard to share antique photos with a lot of people. So 1000memories created a service for digital memorials, where all of these friends and family members can upload their photos and share their favorite memories in a single place. Now, over a year later, 1000memories is changing things up a bit. Don’t worry, those digital memorials are still a core feature of the site, and all of the memorials that have been created aren’t going anywhere. But the service is adjusting to better cater to the way its users are actually using it. In short, they’re making it a place to share all kinds of digital memories, not just those that concern the recent passing of a loved one. 1000memories cofounder Rudy Adler explains that as people go to create their digital memorials, they often pull out their old shoeboxes full of photos and stumble across pictures of many family members and old friends — not just the one who recently passed away. They’d start uploading all of those to the site as well, but so far 1000memories hasn’t offered a great way to do this. Today that’s changing: 1000memories is launching a handful of new features that make it better suited to share any sort of antique content with friends and family. 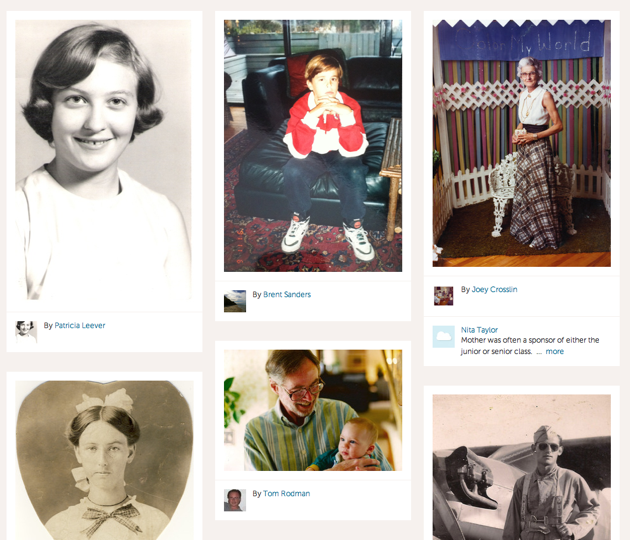 Another way to put it: the service is now a social network for sharing memories. The first feature that will help do this is a section called ‘Shoebox’, which is a feed of everything you’ve uploaded to the site, and what your family and friends have shared as well. To help with this, users will also be able to create memory pages (sort of like profile pages) for anyone, which you can link a piece of content to. And, finally, you’ll be able to set up a family tree that shows how each of these memory pages are linked. To facilitate the process, in the next few weeks the service will also be releasing an iPhone app: take a snapshot of an old photo or letter using your phone’s camera, and it’ll get uploaded directly to the service. This caused me to raise my eyebrows (I’d think people would want to scan these old photographs to make sure they’re saved at maximum quality), but Adler says that the results are surprisingly good. He adds that the service was inspired to do this, because, again, it’s what its users are already doing. In a sense, 1000memories is setting out to become a Facebook for the past. In fact, Adler says that Facebook’s recent launch of the Timeline will actually make things easier for them (it’ll make 1000memories easier to explain).